If you're looking for the perfect gift for a birthday, anniversary or just because, our gift cards make the perfect choice. 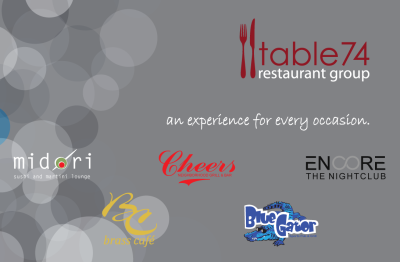 Reedemable at all Table74 restaurants, which includes Midori Sushi and Martini Lounge, Cheers Neighborhood Grill and Bar, Blue Gator Sports Pub and Grill and Encore, the Nightclub. Stop in any of our locations to purchase.